When I was a kid, my mom encouraged my brother and I to take an interest in art. 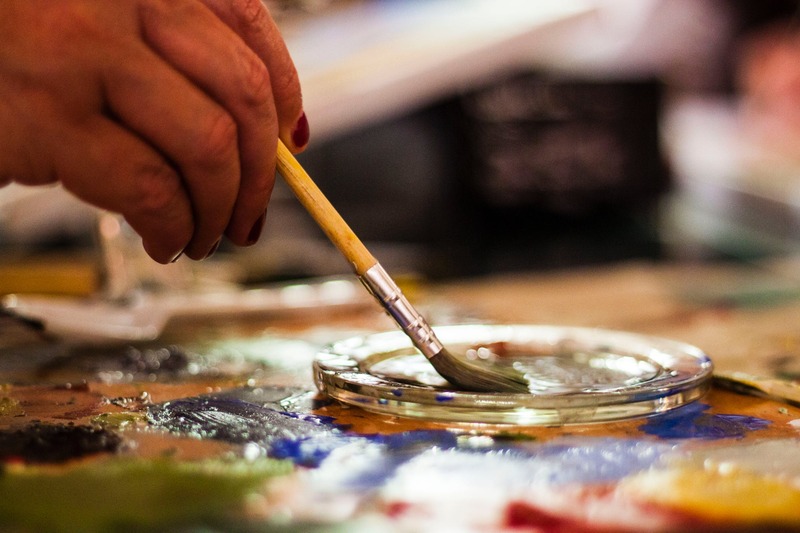 As an art therapist, my mom knew the many benefits of being creative. She also wanted to share her passion with us and help us be well-rounded. One of the ways that my mother exposed us to art was through painting. Every now and then, we would cover the kitchen table with newspaper. Then, we would take out some paint, some construction paper, and some brushes, and have some fun. While painting was an activity that I enjoyed, there was one aspect of it that always annoyed me. It was very difficult to keep your brush clean. After you dipped your brush into one color, you had to be very careful before you dipped it into the next one. Otherwise, the residue from one color would blend with the next one. If you did not clean the brush properly in between colors, you would quickly end up with a dirty, brown paintbrush. Something similar can happen with your brain. When you move from one task to the next, you need to be very careful. If you are not mindful about your transitions, your brain can be like a dirty paintbrush. In this article, you’ll learn why this happens. You’ll also learn three steps to keep your brain as “clean” as possible. In a 2009 paper, Dr. Leroy introduced a concept that she refers to as attention residue. According to this effect, when you switch from one task to another, some of your attention remains stuck with the original activity. This residue has a negative impact on subsequent performance. Dr. Leroy has conducted a number of experiments to study this effect. In one experiment, participants started by working on a set of word puzzles. Some individuals in the study were allowed to finish before moving on to the next task. Other individuals were interrupted during the word puzzles and told they would be switching to an unrelated task: reviewing resumes and making hypothetical hiring decisions. In between the puzzles and hiring decisions, participants were presented with another challenge to test the amount of attention residue left from the first task. Strings of letters were flashed on a screen. Subjects were asked to decide as quickly as possible if the letters made up a real word or a fake word. Dr. Leroy found that participants experiencing attention residue demonstrated poorer performance on this challenge. In addition, the stronger the residue they experienced, the worse they performed. How can you minimize attention residue? Attention residue is a major problem in today’s workplace. Many people bounce from task to task (or meeting to meeting) all day long, without thinking about transitions. Repeatedly and mindlessly switching from one task to the next leads to an especially thick residue. This leads to unclear thinking, more stress and irritability, and significantly worse performance- especially as the day wears on. 1. Focus on one project at a time (as much as you can). Your thinking will be clearest when you focus on one project exclusively for a long period of time. There was a 2-month stretch in 2017 when the manuscript for Work Stronger was my only work project. I did not work on anything else. This approach was incredibly energizing and much more productive than if I had tried to juggle several other projects at the same time. Now, it might not be practical or realistic for you to focus on one project for a few weeks or months. You probably have several projects that need your attention now. In that case, try to focus on one project per day. Or, if that is not possible, try to focus on one project on a given morning and one project on a given afternoon. Focusing on one project at a time allows you to get into a rhythm. What you want to avoid at all costs is bouncing in between multiple projects, all day long. That sort of approach leads to a ton of attention residue, reduced performance, and lots of unnecessary stress and irritability. 2. Break down projects into short, clear tasks. Focusing on one project at a time is not enough though. You also want to break down projects into clear tasks that can be completed in 60 minutes or less. This approach prevents you from getting overwhelmed, it gives you a sense of completion throughout the day, and it also minimizes attention residue. If you don’t break down your projects into specific tasks, you will also lose time and energy due to something that I refer to as invisible multitasking. This occurs when you try to do two related tasks for a project at the same time, like writing and editing. When most people think of multitasking, they think of doing two unrelated tasks at the same time, such as having a conversation with someone while replying to emails. Invisible multitasking might not seem like a big deal, since the tasks are related. However, this work style is also disastrous for your energy and productivity, as discussed here. 3. Take short, deliberate breaks in between tasks. You can still experience attention residue, even if you complete a task before moving on to the next one. In addition to breaking down your projects into clear tasks, be intentional with how you transition from one activity to the next. Taking short breaks throughout the day helps minimize how much attention remains with the prior activity. A strategic, energizing break is like cleaning off your paintbrush before you dip it into a new color. Don’t use the break to complete other tasks or to check email. Use the time to stand up, go for a short walk, drink some water, do some light stretching, etc. The goal is to give your mind a break before you dive into the next task. A short buffer is extremely valuable and not a waste of time. It helps you bring more focus and energy to your next activity. Many people lose a ton of time and energy each day due to attention residue. Repeatedly and mindlessly switching from one task to the next leads to an especially thick residue. This leads to unclear thinking, significant stress, and much lower performance- especially as the day wears on. Focus on one project at a time (as much as you can). Break down projects into short, clear tasks. Take short, deliberate breaks in between tasks. Your brain is like a paintbrush. Keep it clean. About the author: Pete Leibman is the creator of StrongerHabits.com and he’s the bestselling author of Work Stronger; Habits for More Energy, Less Stress, and Higher Performance at Work. Before writing Work Stronger, Pete worked as an executive recruiter at Heidrick & Struggles, one of the world’s premier executive search firms. In his free time, he teaches one of the largest group exercise classes in the Washington, D.C. area. He has also competed in the Obstacle Course Racing (OCR) World Championships. Newport, Cal. Deep Work; Rules for Focused Success In A Distracted World. New York: Grand Central Publishing, 2016. Leroy, Sophie. “Why Is It So Hard To Do My Work? The Challenge Of Attention Residue When Switching Between Work Tasks.” Organizational Behavior and Human Decision Processes 109 (2009) 168-181.